The Hudson Reed Kristal triple concealed shower valve provides thermostatic showering via three easy-to-operate controls. Suitable for all types of plumbing installation this shower valve has the added safety benefit of a built in anti scald device should the cold water supply fail. Separate controls for temperature and flow. Operates two shower accessories separately or simultaneously. 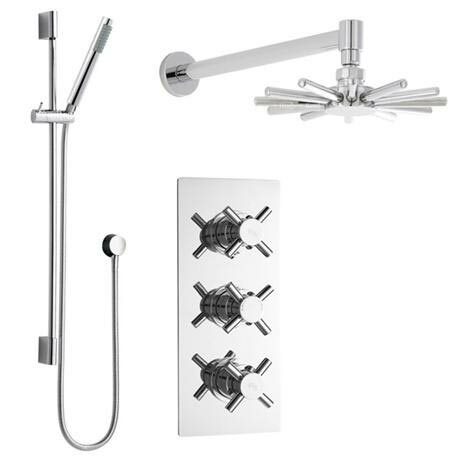 Supplied with a cloudburst fixed shower head with swivel joint and a slimline slider rail Kit with pencil handset, shower flex and outlet elbow. Finish the perfect showering experience in you bathroom with the Kristal triple shower valve with cloudburst fixed head and slider rail kit. It is a stunning example of excellence in contemporary design and build from world renowned manufacturers Premier. It offers and invigorating shower equal to none and delivers a beautiful aesthetic in any bathroom. Built from a brass interior for added strength and durability, yet finished in polished chrome for a stylish finish and shine. It gives you a choice of showering options from using the shower head or the hand held shower for an all over cleanse.